Today was our last day for touring in Beijing. For a change we woke up to blue skies. The wind had picked up last night and blew most of the pollution out of the city and out to sea. It's nice to see what the city really looks like! 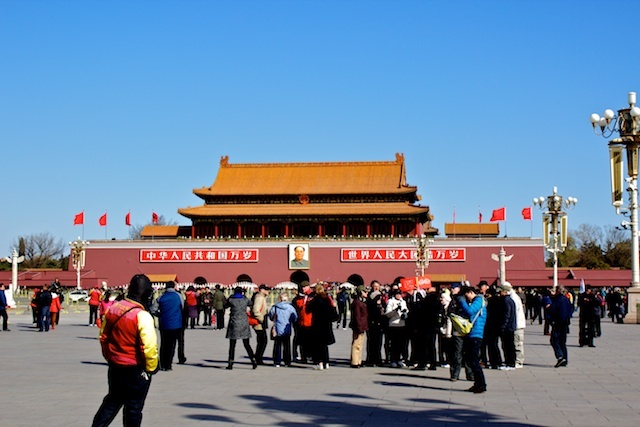 This morning we joined our tour bus again for a trip to Tiananmen Square. The bus parked a block away and we walked through a tunnel under the road to cross the busy street. 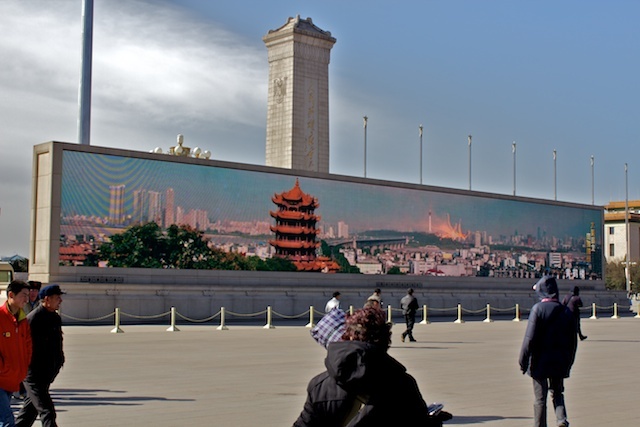 Besides the buildings around the square , a very large screen has been set up next to the "Monument to the People's Heros". This screen shows the tourist sites being promoted. Our guide took us around and explained what the various buildings around the square are. We did not go into any of the buildings, but the tour company sent a photographer to take a picture of our group on the square. They sold the photos to anyone who was interested in a book showing all the places we visited over the last 3 days. It was a really nice souvenir, so we got it. 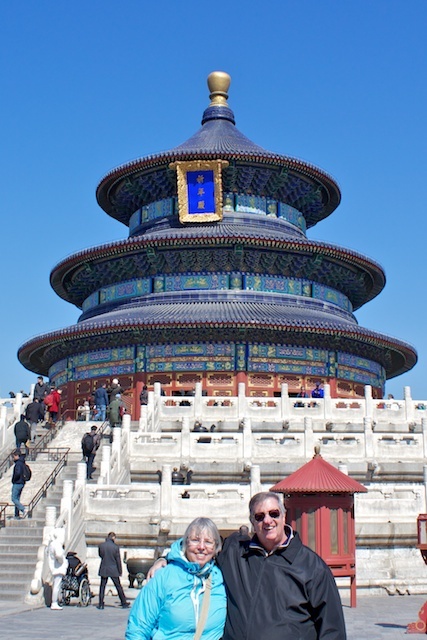 Next we visited the Temple of Heaven. 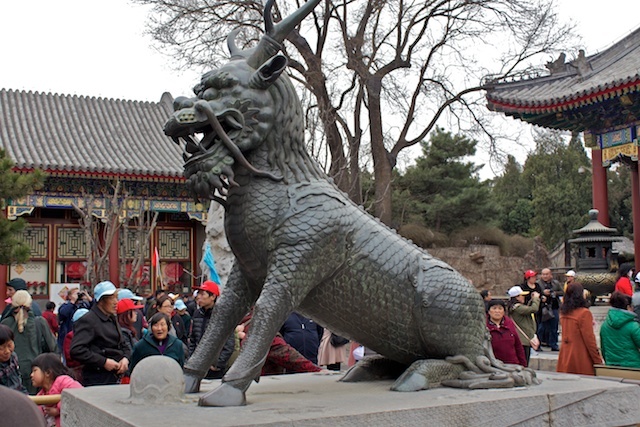 This is a former Buddhist Temple that is now a museum and park for the Chinese people. Our guide said only 8% of the population now practices any kid of religion today. All throughout the grounds, people were playing games, doing Tai Chi, dancing or singing. It was crowded and everyone was having a great time. It seems like a nice use for this large open space. The original itinerary gave us free time on our own this afternoon, but the majority of people on our bus were not interested in shopping on our own. 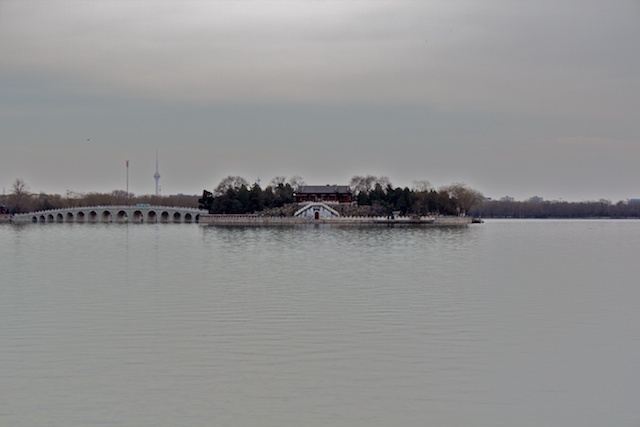 Yesterday our guide suggested that, if enough people were interested, he would arrange an afternoon tour to the Birds Nest Stadium and the Summer Palace. Half the bus raised their hands, so he made the arrangements, got a price, and offered it to people on the other buses as well. We came back from our tour this morning, got lunch at the hotel, then went back down to the lobby to join the extra tour. There were 14 people from our bus and another 14 from the other 3 buses at our hotel. An hour bus ride took us to the site of the 2008 Summer Olympics. 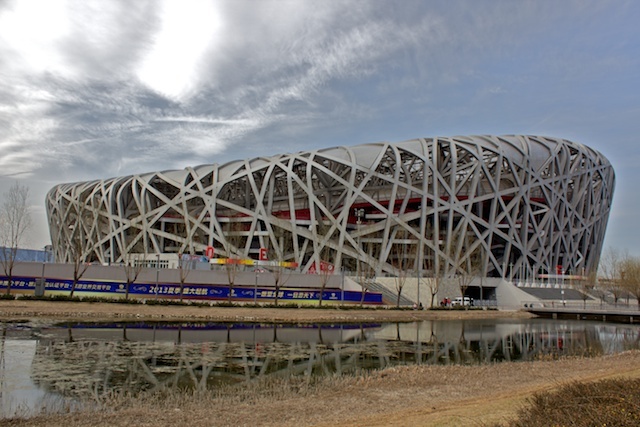 The Birds Nest is the beautiful stadium that was built for the Olympics and where the opening and closing ceremonies were held. The Olympic Flame which was originally on top of the stadium proved precarious over time, so it was moved to a spot on the grounds, just outside the stadium. We were able to go inside and look around. They were in the process of cleaning up grass colored rugs and artificial snow that had been there for a winter carnival that is now held there every winter. Only one of the big screens that were mounted above the stands is still there. It was showing a video about the 2008 games on a continuous loop. We sat in the stands for a while, taking photos before walking back to the bus. Our next stop was the emperor's Summer Palace. This is a series of buildings around a lake, with a temple high up a hill and a few other towers a little distance from the lake. It was a very lovely site and there were loads of tourists there. Of course, most of the tourists are Chinese or Japanese. Our group stands out everywhere we go. A few people from our group didn't want to walk too far here, so our guide showed them a place with a nice view where they could wait for us. One woman sat on a step at the corner of a nearby building and later said she had a great time there. Several people stopped to take her picture and one older gentleman kept staring at her and smiling whenever he caught her eye. Most of the buildings had lovely bronze statues on either side of the entrance and interesting rocks set up in the courtyards.. There were deer, cranes, lions, as well as a few mythical creatures. A house built for the emperor's mother had small windows in all different shapes all along the wall facing the lake. so she would have a variety of views. Plants were painted on the windows to add to the view. We were in rush hour traffic on the way back to the hotel. Traffic here is really bad - reminds me of New York City, but with lots of bicycles, motorbikes, and an assortment of unusual looking trikes mixed in. Once back at the hotel we had a drink and a light meal at the bar, then headed up to pack. Tomorrow we will be on our way home.